Motherhood is said to be one of the most important experiences for a woman (and we know a lot of women who will disagree, but that’s another topic of discussion). It's an exciting thing, a beautiful role for women, a new time of self-discovery. There’s no denying that pregnancy for women is an evolutionary process, one that creates a whole new woman. A mother has to set her own needs and wants aside and devote herself entirely to the baby, because her child's survival depends on that devotion. So, despite all the pain during pregnancy and labor, physical and psychological changes, the first months after childbirth could be pretty challenging too. From mood swings to hair loss and insufficient sleep or new bedtime hours, tired mothers around the world have many uncomfortable stories to tell about the reality of motherhood. And despite all of this, mothers (especially new mothers) have to take on one of the world’s most challenging roles and then come out of it with flying colors! Even when mothers think they may have gathered the most important information about parenthood, from other parents, books and programs or even the internet, nothing can compare to the reality of having a baby, and the challenges that come along with it. Mistakes are bound to happen, because we’re all humans in the end. Lydia says sometimes a walk to the park can be quite an adventure before you leave your doorstep. "Every Sunday, we have this thing with my daughter, we get up around eight o’clock in the morning and go to the park for a walk. I dress her up, put her in her baby stroller, grab a cup of coffee to take with me. That's how I start most of my Sundays." "Unfortunately, one Sunday I forgot my coffee at home, so I left the baby stroller outside my door step for a moment to go get it. When I got back with my coffee in hand, I saw the most terrifying scene, in my whole life. The baby stroller had started rolling across the road. WITH MY BABY IN IT!" "I ran towards it and I grabbed it without Nadia or anyone else getting hurt. My heart was beating so violently that day, even for two hours afterward. I felt like the worst mom EVER." Sometimes planning the perfect surprise party can be too much. Just ask Kerri about how her son's 6th birthday went down. "Billy was turning 6 years old and we were having a big surprise birthday party for him. His favorite cartoon character was Mickey Mouse so I ordered a birthday cake with Mickey on it. I had invited the whole family over and we waited for him after school. I bought him a bicycle for a present and put it behind our sofa, so he could see it clearly after entering the house." "When we heard him coming in, my husband opened the door and the whole family, including me hid in the dining room. When Billy came in the room, everybody shouted, “Surprise” and I jumped out of hiding. I had been kneeling down with his birthday cake in my hands so he could blow out the candles afterward." "But my jump didn’t turn out and I fell FLAT on the cake. And as if that wasn’t embarrassing enough, my hair landed on the candles, setting it on fire!" Zoe has her own bad experience with smartphones and baby combination. "I had an obsession with selfies at one point, especially selfies with little Ryan and me. We had just returned from a walk in the park and Ryan needed a bath before dinner. It was around eight o’clock in the afternoon and my husband was on a business trip, when he texted me that, he misses us." "I got a brilliant idea while I was waiting for the bathtub to be filled, I would send a selfie to him. Ryan was inside the bathtub, playing with his yellow ducks and having fun as I tried to take the perfect pose in the mirror. Suddenly he started crying. When I turned around I saw he had accidentally switched on the hot water." "He almost got burnt, but thank God I got him out in time. It was irresponsible of me and I feel awful every time I think about this accident." “Having a smartphone these days can get you in a significant amount of trouble” says Mina, a 32 year old mom. “I was nervous with my new responsibilities as a mother, so I was careful with my every move. Right from picking my little George up to breastfeeding him – everything had to be precise. I thought that I was doing well, and I start getting loose after the first few months." "One day at my mother’s home, George was hungry so I prepared myself for his breastfeeding process. I took my bra off, placed my baby in my arms and started feeding him. My phone, which was right next to me, suddenly rang and after I attended the call, I saw notifications on my phone. And so, I started reading Facebook message from my husband." Here's a very unique skiing experience told by 35 year old Sarah from Boston. “This happened maybe 7 years ago. My husband and I had decided to go skiing after five years of marriage and without any vacations. It was a bit difficult to plan a trip with our hectic job schedules, not to mention our 4 year old baby’s responsibilities as well. But when Matthias turned five, we booked a ten days’ trip at a skiing resort and prepared ourselves for the time of our lives!" "On the very first day of our trip, I didn't lose any time. I got geared up and went to the top of the mountain and prepared to ski down to the bottom (I used to be a pro in my college days). I could see Matthias and John at the bottom of the hill, waiting for me to come down. But I was unfortunately coming down so fast that I couldn’t slow down on time"
Mary, a 30 year old mom from Kentucky, shared her most awkward moment she had so far, with her little daughter Lucy. “I was so grateful for my little tiny creature. I took daily pictures of her and uploaded them on my Instagram account so that everybody could see how beautiful she was. My Lucy has big brown eyes with thick blonde hair, and I used to dress her up in cute dresses (and even some suits) and take hundreds of photos of hers." "One sunny day, I decided to take a walk around the park with Lucy and enjoy the beautiful weather, together. I let her down, and she looked so cute walking around in her red dress, so of course I took a picture (or maybe 50). And I immediately started editing the photos so that I could post them on Instagram." "As I start walking towards home, checking my account for likes and comments. It took me over 5 minutes to realize I was heading back alone, without Lucy. I immediately ran back to the park, thinking that a million things could have happened to my baby. Fortunately she was sitting under a tree, playing with some flowers and smiling at me as soon as she saw me." Joanna, 23, wanted the perfect birthday party for her son Alex’s fourth birthday. “It was his first big party, with family and friends and I wanted everything to be perfect. On the B-Day, I welcomed the guests in, taking care of the mess around the house and serving drinks to all. Hosting a party was a game for Alex and I enjoyed watching him have a great time. When the party was almost over, he seemed happy and I thought to myself that this was a big success." "After our guests had left and I had washed the dishes, taken the garbage out and getting ready to have a shower before sleeping, Alex start wondering where his presents were and explained to me that he had put them in a black bag, because he didn’t want to make a mess with the wrapping paper. That poor little tidy thing didn’t have a clue about what was happening, but I knew exactly what I have done." "When I took the garbage out, I wondered for a moment, why there were two black bags filled? Because I remembered that I had only one with trash! I threw them quickly into the dumpster and got back inside the house, thinking that my husband must have filled the other one. I didn’t manage to get them back so Alex cried the whole night, making me feel like a terrible mother and totally stupid!" The combination of phones and babies can be pretty dangerous, according to 21 year old Lilly from Ohio. “It was Monday morning when I woke up and decided to take little James with me to the supermarket. I can still remember - he was wearing a blue Toy Story t-shirt with and a white winter hat, because it was a bit cold that day. After dressing him up, I packed everything I needed in his my bag and got inside the car. I buckled him up, and drove straight to the supermarket." "Just when I was parking my car, my phone rang and it was my friend Helen, another mom whom I’d recently bonded with. I was explaining to her that we had arrived at the supermarket, and I got out of the car to speak to her. I turned my back to the car for maybe 1 minute, only to turn back and realize that I hadn’t used the hand brake." "The car was moving forward to the parking fence, with my baby in it! I instantly threw my phone away, ran towards the car and sorted my mess out. Even my husband does not know this incident happened. I am SO embarrassed by it." It's easy changing a diaper once in awhile, but does it get an easier on a daily basis? No, not really, according to Agatha. "My cutie pie, Susan, was 8 months old when I went back to the office. I was working full time as a consultant at an insurance company, and I was a first time mom, too. I was feeling extremely tired after work one day and I had been in bad need of a good night's sleep for months." "One afternoon Susan was restless, crying and moaning all the time. I fed her and tried to put her to sleep, but she still wailed hopelessly. I put the pacifier into her mouth, over and over until she finally fell asleep. It was only later that I realized the reason for all her fussing, I hadn’t changed her diaper all day." "I went to her pediatrician and he told me that she got an infection from the dirty diaper and needed some antibiotics. Between my tiredness and the crying, I totally forgot that she needed a diaper change." Preparing dinner isn’t the simple process it once was for Amy. "The first feeling that comes to mind as a new mom, is sheer exhaustion. Simple everyday tasks become huge challenges, in all the wrong ways. This one time I was preparing to roast a leg of lamb for Sunday dinner. I had put the lamb on a baking tray and put it in the oven and was finishing the salads when I thought I could use a short break in the sofa." "Meanwhile, Tom (my son) was playing with his little car toys in the kitchen. The short break turned into a two hours sleep. I was woken up when I heard Tom crying loudly. I run to the kitchen and saw the oven in flames and Tom hiding under the table crying. Scared to death, I managed to extinguish the fire and calm Tom down. I can’t imagine what could have happened if I didn’t wake up on time." It's good to encourage kids when they have a special interest like music, sports and art. But Jan's art appreciation wound up going a little too deep. "William was obsessed with coloring books and coloring the house in general! We had bought him everything to play with, from pencils to watercolors. He adored painting everything he had in his hands. Red was his favorite color, he painted all his books red, and even the sofa and the fridge." "One day as I was watching a TV show, I had William in the living room with me, he was painting at his kid table while I sat on the couch. He had his snack and juice sitting on the table too. When I went to clean up his snack afterward I didn't realize he had switched the fruit punch I gave him with his painting cup that had the red paint in it." "So when I thought he had finished with the juice, I drank the rest of it. I knew instantly that something was wrong, but even so it took a few minutes to understand I drank red paint instead of strawberry juice but thankfully I was alright. Yeah, I should have known what was in his cup, but it was a parenting reflex." We don't think Susan will drink fruit punch juice again. 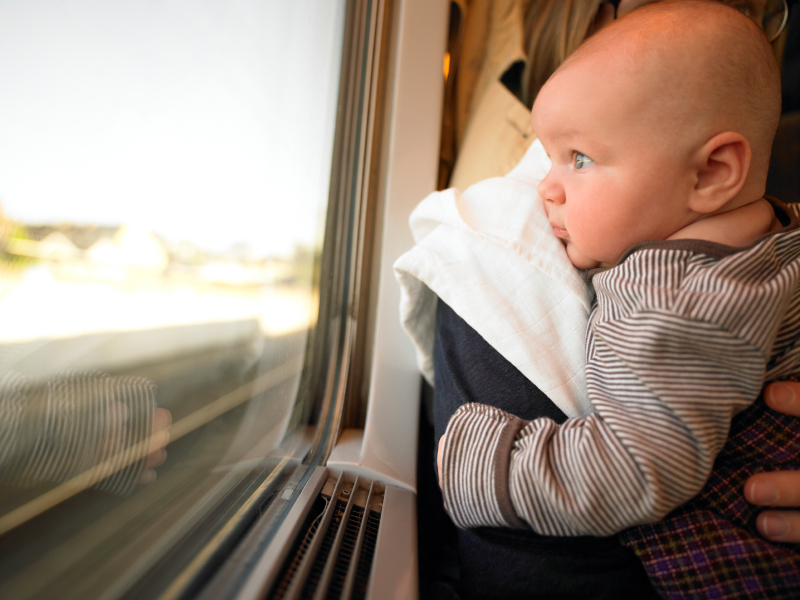 Traveling with a baby can be a nightmare, says Jennifer. "We wanted to visit my grandfather for the weekend, so we had to take a bus for three hours to get there. My husband and I woke up early, packed our suitcases and the baby’s bag and got on our way to the bus station." "My baby girl, Kathrine was 5 months old at the time, so I hoped she would sleep during the trip. We got on the bus and about an hour later she started crying, really loudly. I knew I had to change her diaper because the poop smell was all over the bus making the air unpleasant to breathe. But the truly unpleasant thing was that I had forgotten the baby’s bag at the bus station and I couldn’t do anything to stop her crying." "I'm sure all the passengers couldn’t wait for me and my husband to get off the bus, what with the unbearable smell and the loud crying. After half an hour the driver made a special stop for us, at a local supermarket and I changed her there. I was so embarrassed!" "You know that the first thing that will be missed by a mother during the first months of motherhood is sleep. After June was born, the maximum amount of hours that I slept a night were three or four. I had to breastfeed her so I was staying up all night and day and maybe managing to have a nap two times a day when June slept." "One Tuesday afternoon, when we had just returned home from my mother’s, June fell asleep instantly when I placed her in her crib. This was my chance to have a break and take a nap. I quickly threw off my pants and fell asleep in my bed. After an hour she started crying because she needed a diaper change. I remembered that we didn’t have any diapers in the house, so I had to get the diapers from the car." "I ran outside to get the diapers…and didn't realize I didn't any pants on. I was standing outside the house, in front of my neighbors in my underwear! How embarrassing!"